KJV-onlyism – King James Only? Does Revelation 22:18-19 Teach Perfect Textual Preservation? The above verses have been used to argue for the King James Version against other translations of the Bible. Simply stated, the argument is that the original text is preserved in the KJV and that all other translations add to, or take away from the original text. Our question is this, “Does this passage actually teach said doctrine?” Some say that it does, and others say that it does not. What do the Scriptures say? First of all, let us ask what words are. That is what we are warned against embellishing or removing. Words are expressions of thought. The form of words change over time so that words become archaic and are replaced by other words that convey the same meaning. One instance of this is that we use the word “let” to mean “to allow”. In the King James Version the word was used to mean “to hinder”. We must ask ourselves, then, whether the use of synonyms is acceptable in Bible translation. We must then ask ourselves whether a sentence in a more recent English translation of the Bible could have more or less words in it than a sentence in the KJV contains and yet still convey the same thought. In the Scriptures we find that sometimes the very word “word” is used to express the decree, or command of God. One example can be found in Psalm 33:6-9 where we know that it simply means that God spoke the command and the worlds were made. We again see this in Hebrews 1:3 where we find that universe is sustained by the word, or decree of God. The meaning of “word” does not have to be the lexical form of a word, but can be a word, its synonym, or the command of God. The Bible does not condemn the use of synonyms or loose quotations of Scripture, as long as the thought of the Scripture is conveyed. Most students of the Bible are aware of the fact that the New Testament writers sometimes quoted the Old Testament in ways that were definitely not verbatim quotations. One interesting instance is found in James’ writing. James said, “Do ye think that the scripture saith in vain, the spirit that dwelleth in us lusteth to envy?” (James 4:5) Have you ever tried to find the instance in the Old Testament where that statement is made? Most of us will admit that there is no place in the Old Testament where one can find this statement verbatim. It will not do for someone to claim that the Bible writers were inspired and could use Scripture in such a fashion, because to do so would be to charge the Bible writers and God the Holy Spirit with inconsistency. After all, if God tells us not to change the form of one single word, we can be sure that He would be inconsistent to command one to do so even if he were inspired. What, then, of the jots and tittles of Matthew 5:17-18? What is that all about? Simply put, it means that the Scriptures will be perfectly fulfilled. We have a saying today that goes something like this: “He follows the rules to the letter.” What we mean is that a person strictly adheres to the meaning and intent of the rules. So it is with God’s Word. All will come to pass perfectly, just as God has told us. The words of Jesus concerning jots and tittles cannot teach perfect textual preservation, because the law itself neither teaches, nor is presented as an example of perfect textual preservation. This truth is seen in a comparison of the ten commandments as given in Exodus 20 and Deuteronomy 5. When Moses spoke the law to Israel the second time he did not speak it verbatim, but actually added words to what he said previously. We will find, too, that it is this same Moses who said that we are not to add to the words of God. What is meant by the adding to and taking away of Revelation 22:18-19? The answer to that question has to be found by considering the previous places in which we were warned not to add to, or take away from the words of God. Moses told Israel, “Ye shall not add unto the word which I command you, neither shall you diminish ought from it, that ye may keep the commandments of the Lord your God which I command you. ” (Deuteronomy 4:2) Why was Israel warned not to add to, or take away from the words of God? So that they would obey God. The issue that is before us is that the message cannot be changed by adding commandments, or taking away commandments. Either one would be sin. Either one would lead people into disobedience. That is why Jesus rebuked the Pharisees, because they were adding commandments to God’s Word, and taking away commandments, also. (See Matthew 5:33-35;15:1-10) Furthermore, Moses told Israel, “These words the Lord spake unto all your assembly in the mount out of the midst of the fire, of the cloud, and of the thick darkness, with a great voice: and he added no more. And he wrote them in two tables of stone, and delivered them unto me. ” (Deuteronomy 5:22) We already saw that Moses did not give a verbatim quotation of the ten commandments here. Now he adds that God gave them no more words. In other words, the law that God gave at Sinai was all the word that they needed at that time. Simply put, “Ye shall not add unto”, or “He added no more” simply means that what they had been given was all that they needed. The message that God had given Israel through Moses was sufficient for them at that time, and was not to be changed so as to make the message say something that God did not say. In the same vein of thought, we read in the Proverbs, “Every word of God is pure: He is a shield unto them that put their trust in him. Add thou not unto his words, Lest he reprove thee, and thou be found a liar. ” (Proverbs 30:5–6) Those who add to the words of God will be shown to be wrong, and demonstrated to be liars. One is not a liar who uses synonyms and yet retains the message accurately. He is a liar who changes the words to the extent that the message is changed. God’s warning is for us to not change the message. This is the foundation of Paul’s anathema in Galatians 1:7-9. The message IS NOT TO BE CHANGED! Thus it is that Revelation 22:18-19 is the last in a long chain of warnings against changing the message of God, and not a text that supports the doctrine of perfect textual preservation. Part 1 set the stage, and part 2 dealt with “the appeal to faith”. Part 3, covered “the appeal to reason”. Now we’re picking it back up at “the appeal to evidence”. For this argument, I’m going to quote Kevin Bauder at length and then chime in some of my own thoughts. The third illusion that attends the King James-Only position involves the evaluation of the actual evidence. King James-Only advocates are extremely reluctant to allow the empirical evidence to stand on its own merits. On the one hand, they are fond of insisting that “the majority rules” in textual matters. On the other hand, they are very careful about what they allow to count as a majority. For example, if all manuscripts of the ancient translations of the New Testament are counted, then manuscripts that support the Textus Receptus form a distinct minority. Moreover, according to the actual manuscript evidence, the manuscripts that support the Textus Receptus are not in the majority even of Greek manuscripts until the fourth century or even later. If the theory that “the majority rules” is correct, then the next two questions are, Majority of what? and, Majority from when? I’ve previously made similar points about the nebulous idea of “majority”. In my Majority Rules: Fact or Fiction? series I delved into this. Also, the Greek support for the TR wasn’t really a majority of manuscripts until the 9th Century, per James White. The impression I got in my experience of King James Onlyism was that the “evidence” and the role of “the majority of manuscripts” was quite important. That is what made the whole theory appeal to me as solid. When I found out that often King James Onlyists manipulated the evidence to suit their cause, I started down the disillusionment path. I submitted a paper to Sharper Iron’s writing contest a few months back. They posted it today as one of the three winning entries. I’ll provide a brief excerpt here and encourage you to go over to SI to read the whole thing. “Things that are different are not the same.” So says the title of Mickey Carter’s book advocating the exclusive use of the King James Bible. This sentiment is a fair summary of the mindset of most King James only (KJO) advocates. The differences between Bible versions demand a judgment. Which Bible is right? Troubled by differing Bible versions, many sincere Christians seek for answers. One side affirms that no doctrine is affected by the relatively minor differences between Bible versions. The message is the same, but finer points and particular details may be slightly different. A typical KJO position jumps in and says this can’t be right. Verbal inspiration is useless without the preservation of those very words of God. In fact, we need to know each and every word, in order to live (Matt. 4:4). All differences, even word order and spelling differences, matter (Matt. 5:18). Differing versions cannot both claim to be translations of the perfect, inspired Word of God. On the face of it, the KJO argument makes sense. When we’re speaking about the Bible, shouldn’t every little difference matter? 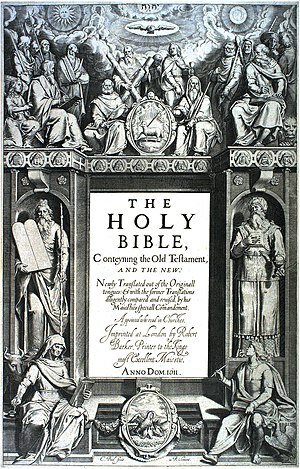 Some respond with manuscript evidence that calls into question the choice of the King James Bible as a perfect standard. Others have shown that the various proof texts for word perfect preservation don’t actually promise a single, identifiable, word-perfect copy of the Bible. And prior to 1611, where was such a copy to be found, anyway? The show went well. Damien and I co-hosted the Understanding Our Times Radio show for Kevin Thompson. We shared our stories regarding KJV Onlyism and were able to address the debate. 30 minutes goes by fast, but we covered quite a bit of ground. The show is available for free download from BlogtalkRadio. Click here and then click on the download button (or else just listen online). The direct link for the mp3 is here.